“A force of nature” – a friend to all she met, with a gorgeous smile, quick wit, and hearty laugh; she was a unique personality. It with great sorrow and heavy hearts that we announce that Nori passed away unexpectedly at her home in Sechelt. Nori was born in Red Deer, Alberta where she attended high school. In 1976 she attended the University of Alberta, completing a Bachelor of Arts in Psychology in 1979. In additional to her academic studies, she played violin with the university symphony orchestra. After completing legal administration training at a college in Red Deer, she worked with law firms in various roles, eventually becoming the Human Resource Manager with a number of major law firms in Edmonton. Nori married Mel Majeau in 1985 and together they spent the next 20 years in Edmonton living in an area overlooking the downtown and river valley to the north. They enjoyed participating in numerous fund‐raising charitable activities, notably in support of the Compassion House Foundation of which Nori was one of the original board members. In 2005 they moved to Vancouver where they enjoyed living downtown, the dining and outdoor experiences of the False Creek and Granville Island area. In 2011 they moved to Sechelt to enjoy the scenic beauty of the Sunshine Coast together with the lifestyle available in a smaller community. Nori was an avid swimmer and enjoyed the ocean experiences of Davis Bay. In the winter months, she and Mel lived in Green Valley, AZ where Nori was a member of the GV Swimming Club. She participated in a number of competitions bringing home a few gold medals. Nori is survived by her husband Mel and his children, Danielle, Marie (Gary), and grandchild, Evelyn, all of Edmonton. Her siblings, Peter Patterson (Margaret) of Suncity West, Arizona, Michael Patterson (Cathy) of Nanaimo, BC, Michael McDougall of Victoria, BC, Marilee Saunders (Rob) of Red Deer, AB, Kathy Adams (Bruce) of St. Albert, AB, and Leonard Patterson of Red Deer. She was Aunt Nori to numerous nephews, nieces and grand nephews and nieces. Nori was predeceased by her parents, Leonard and Arlaween Patterson, and siblings Randy Patterson and Margaret Weinkauf (Lorne). 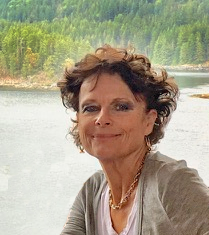 Celebrations of Life will be held at the Sunshine Coast Golf & Country Club at Roberts Creek, BC on May 4, 2019 at 2pm and in Edmonton on May 10, 2019 at 2pm at the Old Timers Cabin, 9430 – 99 Street. In lieu of flowers, the family asks that donations be considered to the Heart & Stroke Foundation in Leonora’s remembrance – number to call 778‐372‐8000 or heartandstroke.ca.